Google Glass has received plenty of attention as a device that could enable all kinds of innovations in healthcare settings. But is there something out there that is the next best thing? Enter Bellevue, WA-based Innovega and its iOptik platform, which Innovega staff members are showing off this week at the International Consumer Electronics Show in Las Vegas. The company says in a news release that prototypes will feature up to six times the number of pixels and 46 times the screen size of other eyeglass type products. Think movies in front of the eye that mimic IMAX, complete virtual reality environments, or a multi-tasking dashboard with five or more typical screens before the eyes. 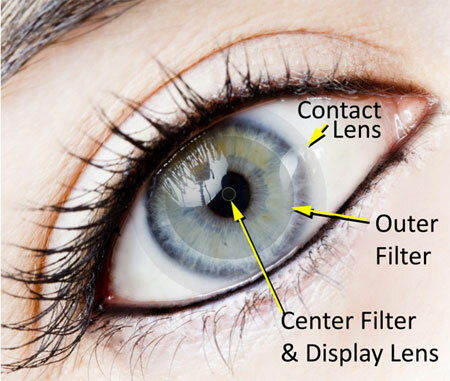 The hitch is that these advances are all possible because users are wearing special "nanotech" contact lenses that then work in tandem with micro-projectors mounted onto eyeglasses. A big question with Innovega is whether health practitioners will be willing to wear special contact lenses in order to have more information flashed before their eyes. And will they even want to have more information flashed in front of their eyes, since there is already enough so much to pay attention to? Leslie Garson, MD, thinks there is already enough resistance among health practitioners when it comes to Google Glass. "A special contact lens as well?" Garson said on the LinkedIn Innovations in Health group in response to an MPMN query. Garson, an associate clinical professor at the University of California, Irvine, suspects little traction among physicians unless the technology is mandated by hospitals or payers. Innovega's setup makes up for the eyes' inability to focus on near objects, providing virtual reality environments and tons of displays without the bulky headsets required in the past. The lenses may be nanotech, but zoom down to the tiny level, there is an elegance to the simple idea involved. Innovega embedded a center filter and display lens at the center of the iOptik that are so tiny that they are smaller than the eye's pupil and therefore do not interfere with vision. A projector can hit those tiny optical elements, which guide images to the retina. But the retina is still getting the overall normal vision provided through the entire pupil, so the brain ends up viewing the projected images and the overall normal field of vision as one. Researchers have been exploring retooling contact lenses for a while. They've investigated their use, for instance, to deliver drugs to the eye. "This new iOptik approach leverages the mature technology used by contact lens suppliers and eliminates the usual bulky optics that have previously been required in the design of video eyewear products," Innovega says on its website. One has to wonder whether there is a potential to correct existing vision problems with the Innovega technology. Innovega's iOptik lenses make up for the eyes' inability to focus on near objects, providing virtual reality environments and tons of displays without the bulky headsets required in the past. When it comes to Google Glass--which is a wearable Android computer with an optical head-mounted display--there is already interest in the healthcare field. Philips Healthcare, for example, is embracing Glass as a way to augment the information that its patient monitoring systems provide. It is worth noting, though, that Glass already is not the end-all-be when it comes to medical devices. For example, a Silicon Valley company called Evena Medical has smart glasses that help nurses when it comes to the classic problem of finding a vein in an obese or elderly patient's arm. But Evena CEO Frank Ball says he did not think Glass was the best fit for Evena because it is not a full glasses format. Evena already had a monacle device, called the Blade, that did not have a high-enough quality resolution to market well in clinical settings. Then Epson came along with its Moverio glasses technology, and Ball and others at Evena saw the opportunity to take advantage of Epson's projectors, prisms, and mirrors--and to incorporate them in a frame that Evena designed. For Evena, Epson Moverio technology proved to be more advanced than Google Glass technology. So could Innovega and its iOptik platform prove even more innovative for other medical device designers?